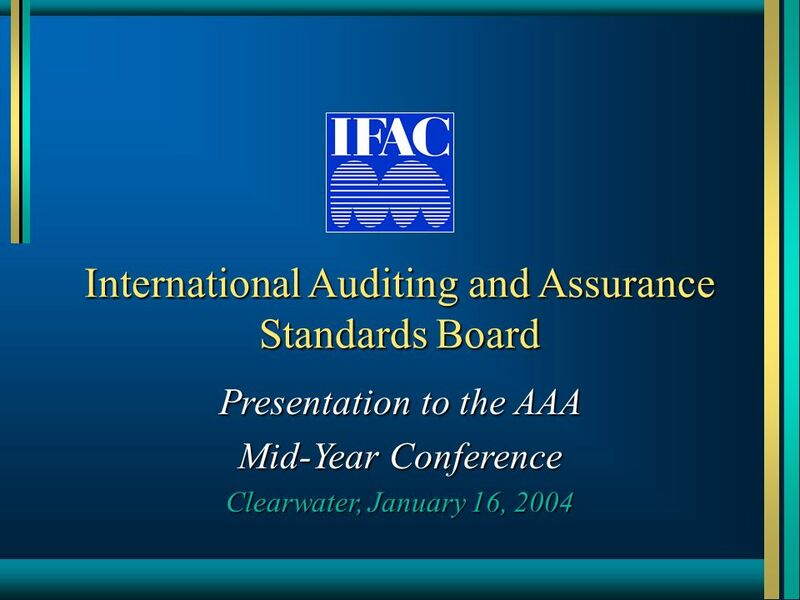 International Auditing and Assurance Standards Board Presentation to the AAA Mid-Year Conference Clearwater, January 16, 2004. 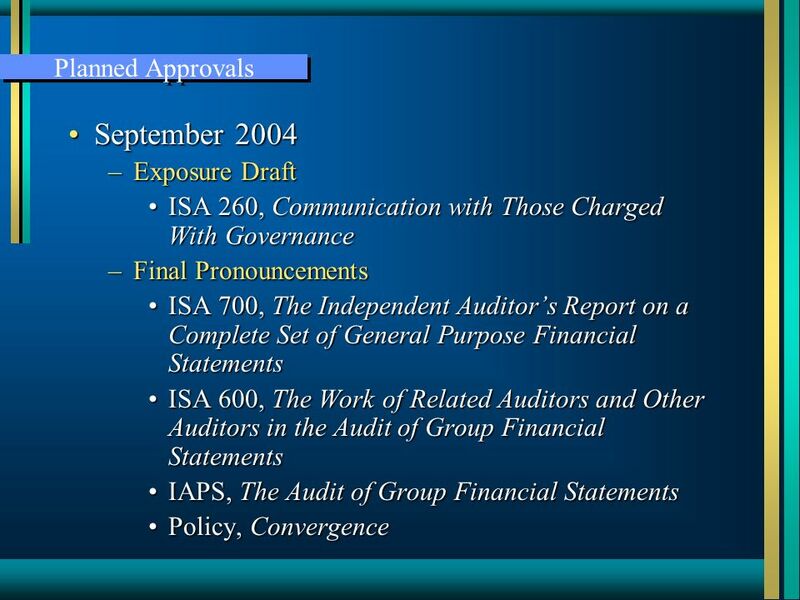 Download ppt "International Auditing and Assurance Standards Board Presentation to the AAA Mid-Year Conference Clearwater, January 16, 2004." Garrett L. Stauffer, CPA Partner PricewaterhouseCoopers LLP. 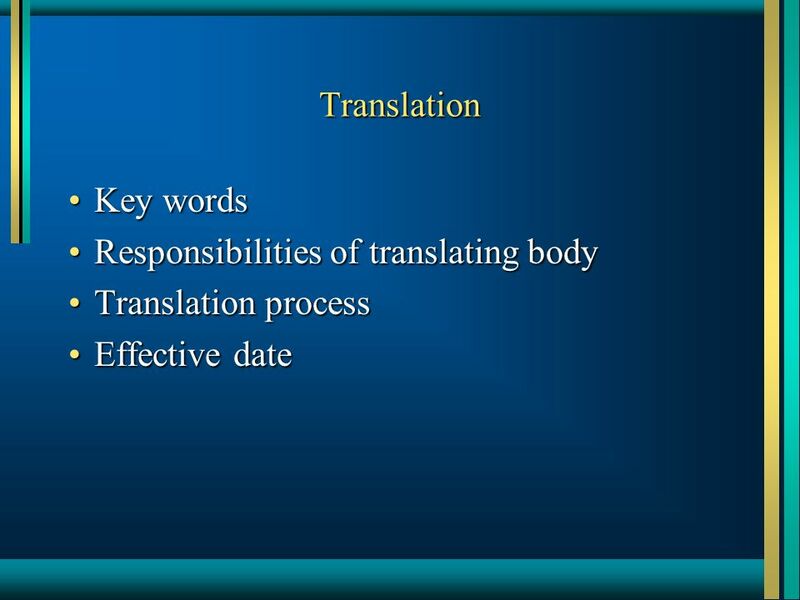 AUDITING Systematic process of objectively obtaining and evaluating evidence Regarding assertions about economic actions and events; To ascertain the degree. 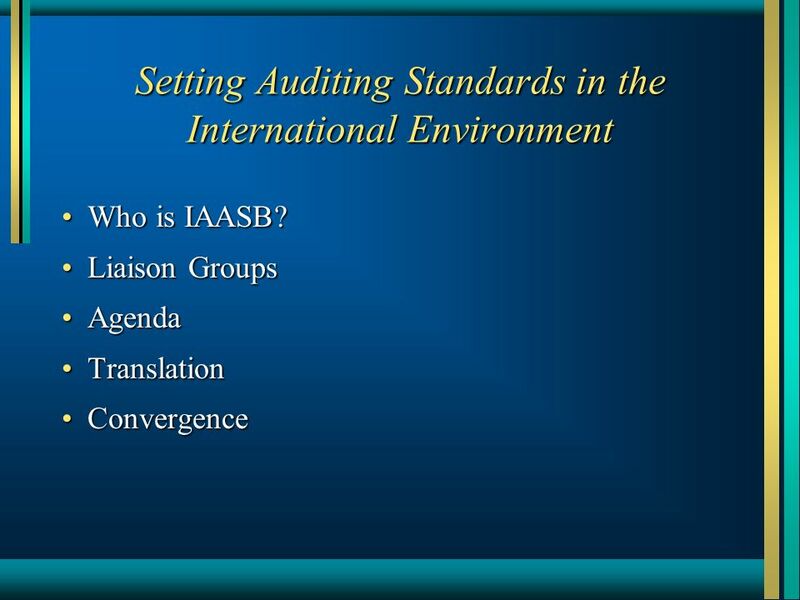 International Federation of Accountants Professional Perspectives Through IFAC Initiatives: An International Auditing and Assurance Standards Board Perspective. 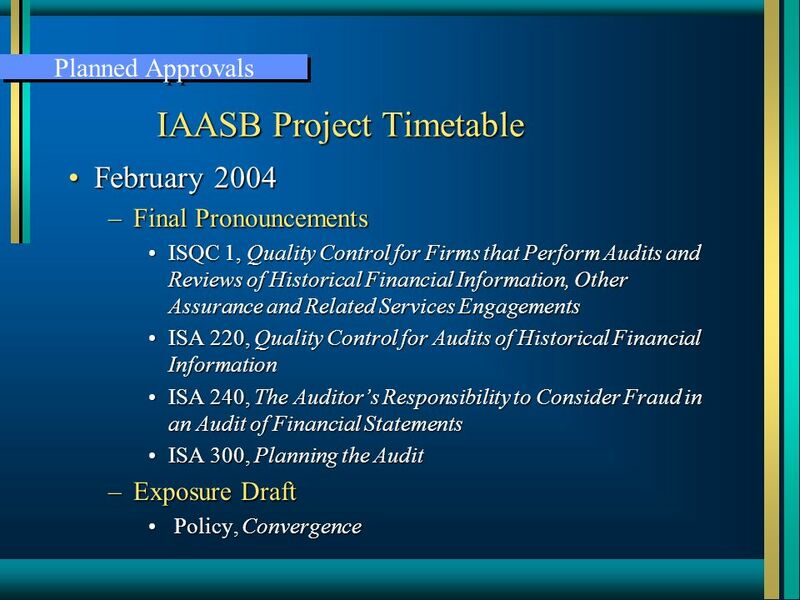 Closed Session 2 - Track B International Standards on Auditing: Adoption and Implementation Challenges and Tools Prof. Arnold Schilder, IAASB Chairman. 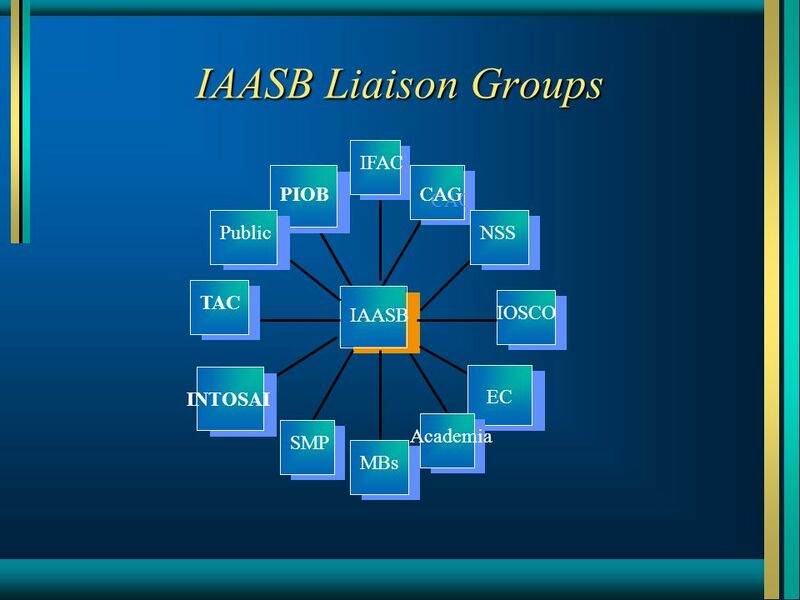 1 Revision of ISSAI 30 – Code of Ethics Project proposal to the Steering Committee of the INTOSAI Professional Standards Committee Bahrain, May 2014. 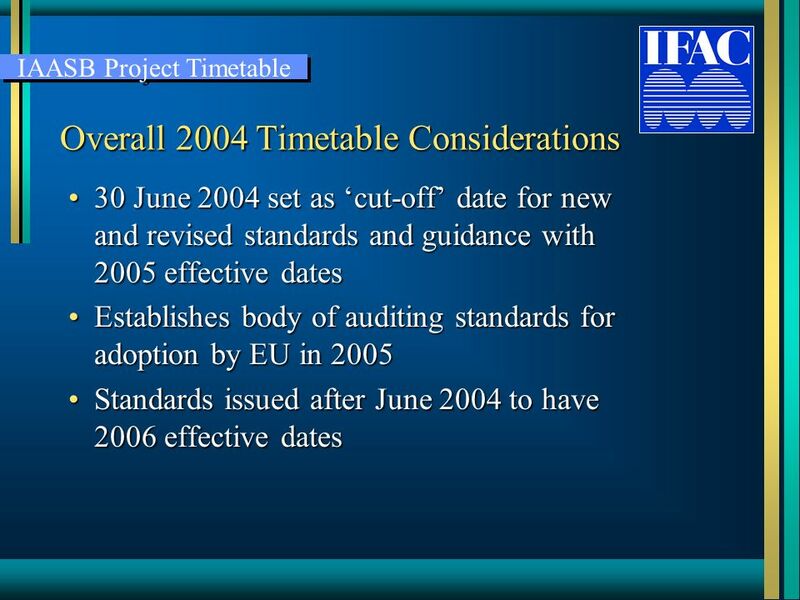 Office of the Auditor General of Canada CANADA’S ADOPTION OF INTERNATIONAL STANDARDS ON AUDITING 20 FACTS PREPARERS of FINANCIAL STATEMENTS SHOULD KNOW. 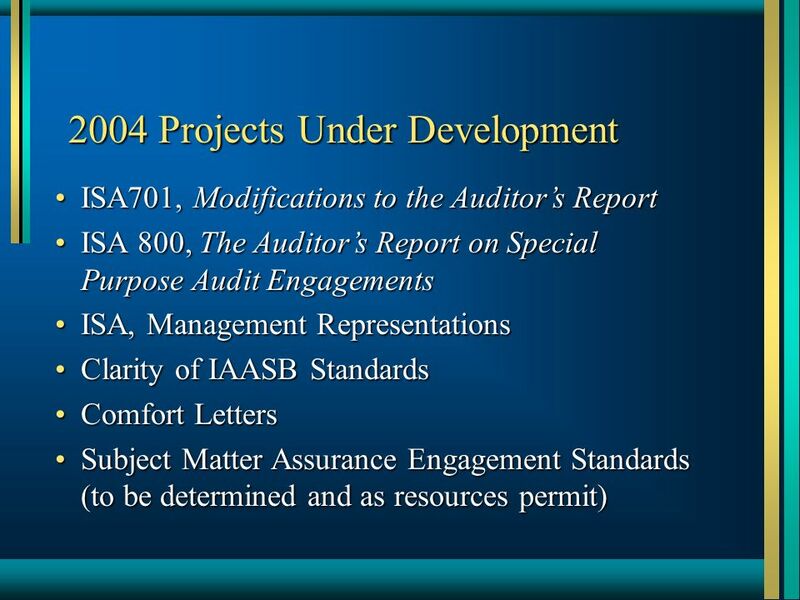 1 ARSC Clarity Project May ARSC Clarity Project Background –ASB approved its clarity project in August 2007 Goals: –Address concerns over length. Breach of a Requirement of the Code Marisa Orbea New York 19 June 2012. 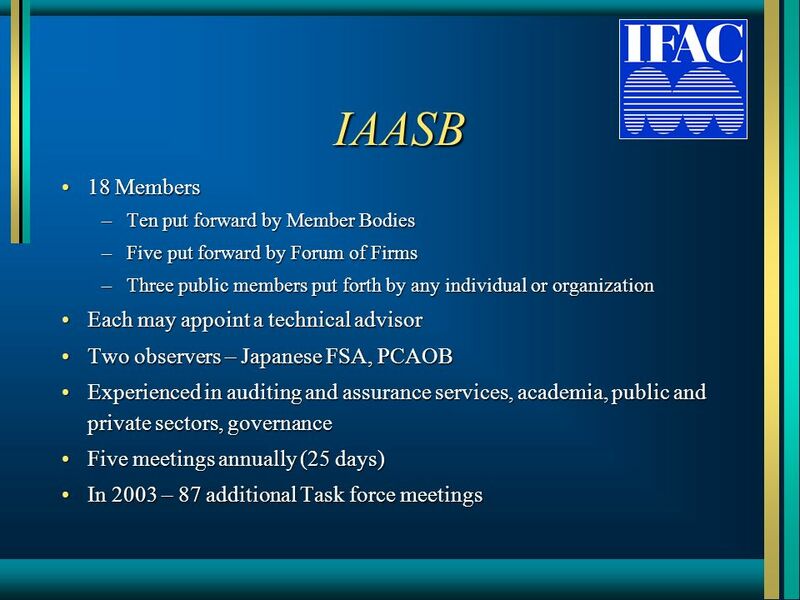 Page 1 | Proprietary and Copyrighted Information Structure of the Code Don Thomson, Task Force Chair IESBA Meeting New York, USA April , 2015.
International Federation of Accountants IFAC SMP Committee Guides Bernard Scicluna Member – IFAC SMP Committee President – Malta Institute of Accountants. 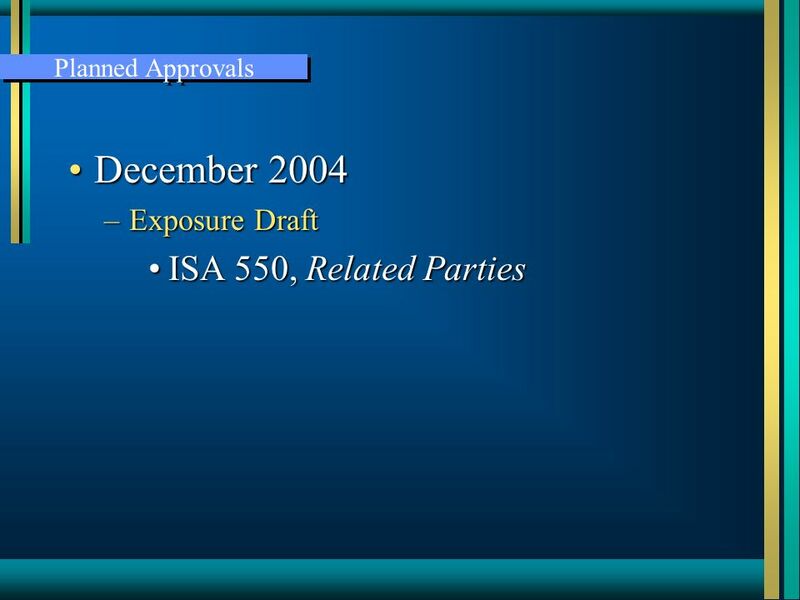 Third Party Reporting © 2008 Ernst & Young LLP. All rights reserved. For Internal Use Within EY Only; Not for Distribution to Clients. Third Party Reporting. INTOSAI and IFAC Robert F. Dacey Chief Accountant US Government Accountability Office. 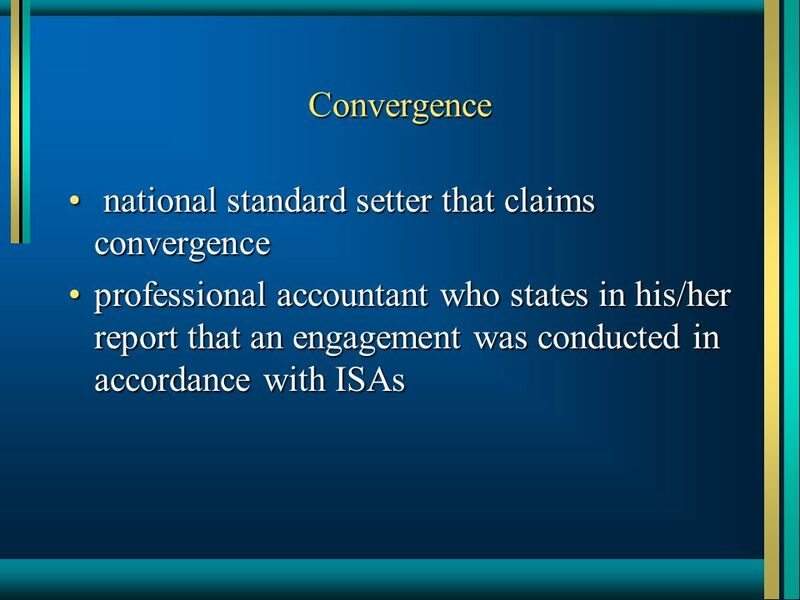 Current Developments at the PCAOB Ensuring Integrity: 3 rd Annual Auditing Conference at Baruch College December 4, 2008. 1 8 th Annual Financial Reporting Conference Baruch College Paul Beswick Deputy Chief Accountant April 30, 2009. KEY ACCOUNTABILITY OVERSIGHT CONSULTATION/ADVICE OVERSIGHT & CONSULTATION 1. Learning Objectives LO1 Describe the current audit environment, including developments in regulatory oversight and provincial regulation of public accountants. 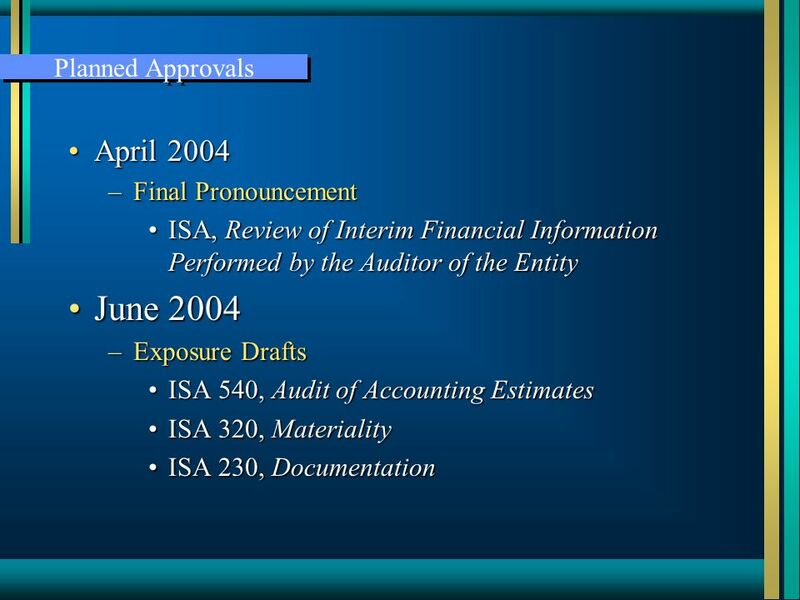 Presentation Subject Header OVERVIEW OF THE ED - ISRS 4410 Presenter: Ashif Kassam Group Chief Executive, RSM Ashvir.